Palm Valley Country Club is located on the Northeast corner of Country Club Drive and Eldorado in Palm Desert, California. Palm Valley is approximately 18 miles from Old Town Palm Springs and the historic movie colony district and approximately 8 miles from Indio, recognized for their annual Riverside County Date Festival and numerous outdoor music events and world class animal shows. Palm Valley Country Club features a 100,000 sq. ft. clubhouse that is the perfect location to host up to 350 guests with facilities for meetings, banquets, parties or weddings. The clubhouse also offers a state-of-the-art fitness center, a junior Olympic-size swimming pool, full service spa, a lounge and outstanding fine and casual dining. Ted Robinson Jr. designed both of the Palm Valley 18-hold courses; the par 72 Championship Course and the par 63 Challenge Course. There is a premier 16-court tennis facility and 45 sparkling swimming pools wtih spas located throughout the country club. Owner must have membership for use of golf, tennis and fitness center. Please check with Vacation Rentals of the Desert for owners membership status. All vacation properties provide attached garage, laundry rooms and bar-b-ques. Each property is individually owned and decorated. Property owners have stocked their vacation home in a turnkey fashion for your enjoyment and have decorated in their own taste. 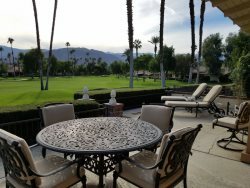 Despite the dramatic mountain vistas, spectacular golf course views, beautiful landscaping and lovely, spacious condominium homes, location is still one of the most outstanding features of Palm Valley Country Club. With easy access to Interstate 10, Palm Valley Country Club is a short drive to all the cities in the Coachella Valley.